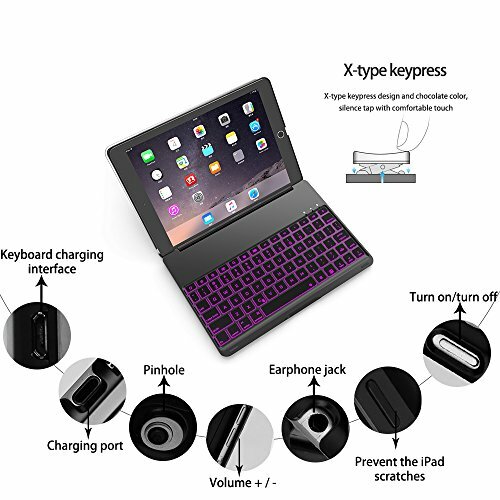 The ipad 9.7 keyboard case can be change your iPad Pro into a stylish laptop, and the keyboard supports 3 systems: fn + Q= android system; fn + W= windows system; fn + E= ios system. Let your iPad also operate like Mac, typing fluently and without delay. Multi angle adjustment, easy to use. 7 color backlight options, 3 levels of brightness. 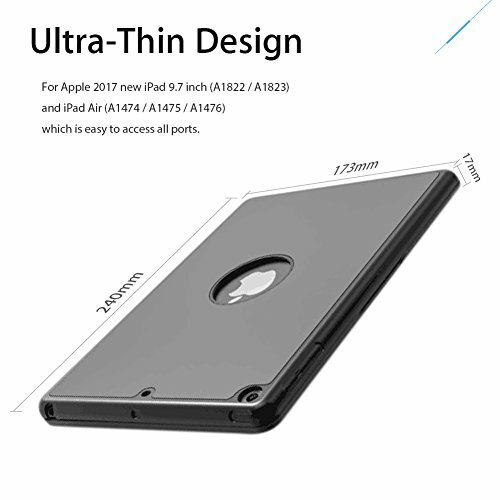 Tailored for iPad pro10.5 (A1701/A1709), the iPad pro 10.5 is suitable for this keyboard case, and all ports/buttons/cameras are accessible. Step 1:Please fully charge the keyboard and open it, the light comes on and then goes off. 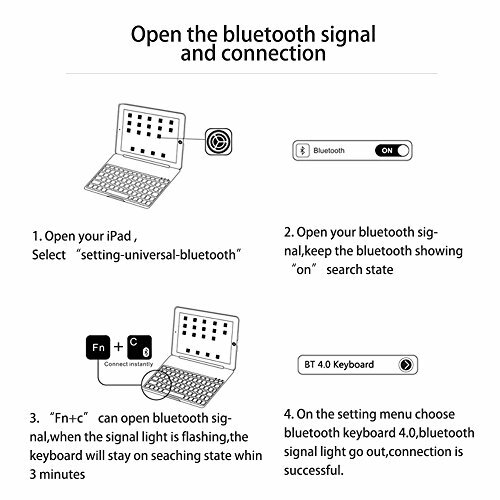 Step 2:Hold on Fn+C to open keyboard's bluetooth. Step 3:Go to your iPad pro settings, click on bluetooth and look for the keyboard. Step 4:Click on the keyboard and it will connect. 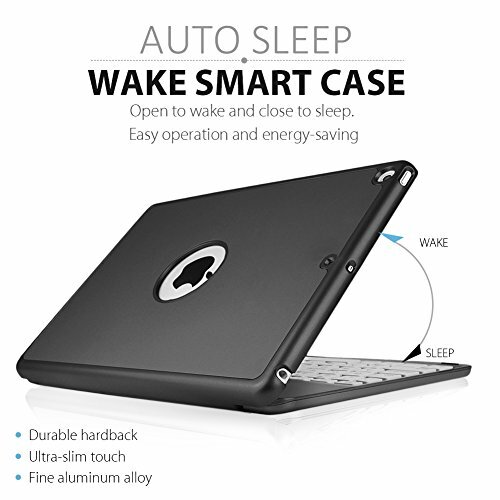 【Auto wake/sleep feature】The iPad 9.7 inch Bluetooth keyboard case with automatically wakes or puts the iPad to sleep when it is opened or closed.. The battery capacity of the iPad new 2017 keyboard case is 500 mAh. In the case of the use of backlight can be used for 5 hours, without backlight can be used for 180 hours. 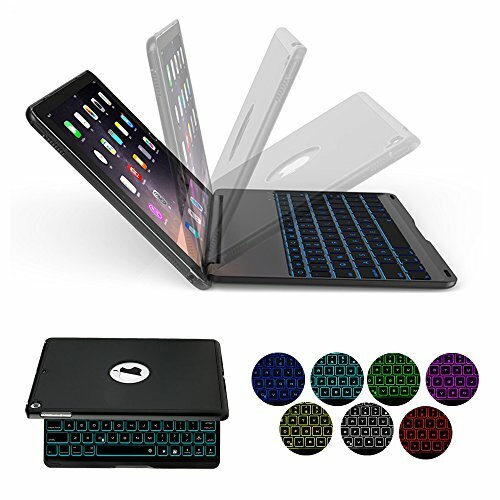 【7 Colors LED Backlit】There are 7 color backlight options of this iPad keyboard case, 3 levels of brightness. You can change the different colors on the iPad keyboard case's backlight button. It's much easier to type in dark or dim lights. 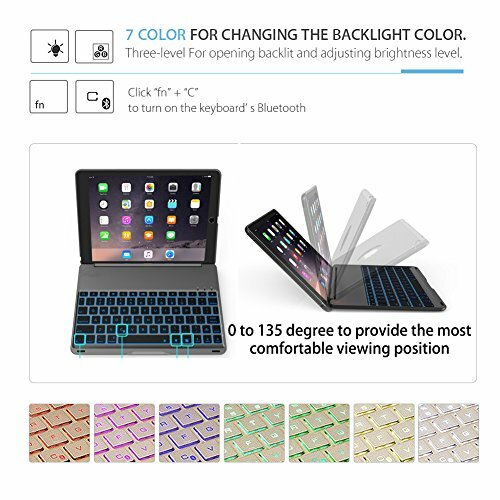 【Adaptation & Good protection】The HotGo iPad 9.7 keyboard case's buttons adopt ABS material, typing smooth, without delay.This iPad keyboard case using Broadcom bluetooth 4.0,with fast speed/long life/ long standby/ low power consumption, charging 2-3 hours, standby 60 days or so.This 2017 new iPad keyboard case tailored for 2017 New iPad 9.7" & iPad Air 1(model:A1822/A1823/A1474/A1475/A1476).All ports/buttons/cameras are accessible.The keyboard case is very solid, and provide great protection. 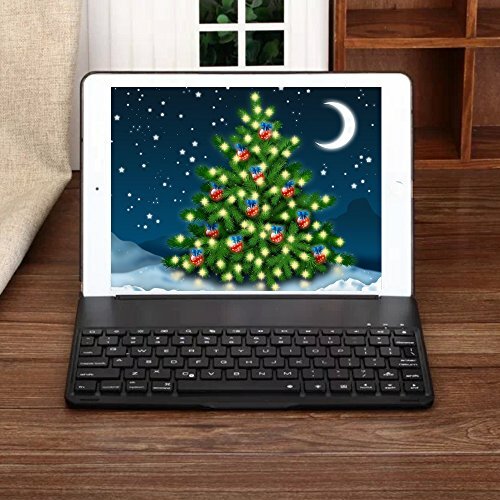 【Multiple Viewing Angle】IPad 9.7 inch keyboard case shaft bracket design allow the iPad to be tilted up to 135° to provide the most comfortable viewing position. The keyboard can't be detached from the case. It fits perfectly with the device and all ports/buttons and camera can be accessed. 【Warranty and Service】If there are any other problems with our HotGo iPad 9.7 keyboard case, please feel free to contact us.Support replacement.Customer service email is available in 24 hours, timely reply. One-year warranty. If you have any questions about this product by HotGo, contact us by completing and submitting the form below. If you are looking for a specif part number, please include it with your message.